Designed by Gerard Unger. Released 2011. 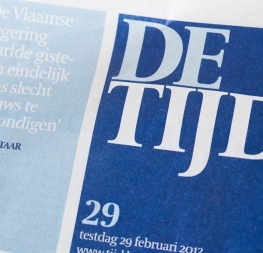 Coranto 2 Headline, with its comparatively taller x-height and condensed width, is intended to set headlines. Coranto 2 is a refined newsface with distinctive character and clarity, able to create an ambience and give editorials a clearer identity of their own. Er war der Urvater der Street-Style-Fotografie, zuletzt ging er zwischen all seinen bloggenden Nachfolgern fast unter. Nachruf auf Bill Cunningham, für den sich halb New York herausputzte. Wenn vor den Modenschauen in New York oder Paris Hunderte von Street-Style-Fotografen die besten oder auch nur die vermeintlich besten Looks fotografierten, konnte man ihn leicht übersehen. Denn Bill Cunningham war nicht besonders groß, zuletzt auch noch gekrümmt durchs Alter, und er spielte sich nicht in den Vordergrund. Er schloss sein klappriges Fahrrad an der nächsten Ecke ab, näherte sich den Frauen unauffällig und machte seine Fotos, meist noch ehe sie etwas bemerkt hatten. Dabei war Bill Cunningham der Vater – oder besser: der Großvater – all der Blogger, die heute mit ihren Street-Style-Fotos das Internet überfluten. Schon seit 1978 traten gut gekleidete Frauen in seiner wöchentlichen Kolumne in der „New York Times“ auf, meist zusammengepfercht auf einer halben Seite in einem arg engen Layout: die Moderedakteurinnen aus Paris, die Gesellschaftsdamen von der Upper East Side, die Einkäufer der japanischen Kaufhäuser, die Stars aus Hollywood. Mal waren sie nach Trends geordnet, mal nach Anlässen. A refined newsface with distinctive character and clarity. Coranto 2, based on Dr Gerard Unger’s 1997 typeface Paradox, arose from a desire to transfer the elegance and refinement of that type family to newsprint. Coranto 2 has a larger x-height and has been made more robust in many places to apply to the demands of newspaper printing. The Headline version has an even taller x-height for increased legibility and is more condensed to save space in the demanding medium. Newspaper production has seen spectacular improvements over the past 30 years in paper and print quality, the introduction of colour printing, and more consistent and accurate register. Newspaper production still demands numerous letterforms, but advancements in printing are better able to bring out details and make typography more appealing to readers. Newspaper text no longer needs to sacrifice its compelling and unique look in order to gain functional superiority, but instead a top priority has become enjoying the reading experience. Today, newspapers are not merely a matter of cheap grey paper, thin ink, and super-fast rotary printing; and type design no longer has to focus on surviving the mechanical technology while providing only elementary legibility. Now there is also room to create an ambience, to give an editorial a clearer identity of its own. There is scope — demand even — for precision and refinement. One consequence of this is that newspaper designers can now look beyond the traditional group of newsfaces. Conversely, a well made newsface can be used outside the newspaper — not an uncommon occurrence. The Opentype update to the refined Coranto 2 type family includes the addition of over 250 glyphs featuring full Latin A language support, small caps, new ligatures, four sets of numerals, arbitrary fractions, and superiors and inferiors. Furthermore, kerning was added and fine-tuned for better performance. Just as is expected, Coranto 2 is intended for running text and Coranto 2 Headline, with its comparatively taller x-height and condensed width, is intended to set headlines. The complete Coranto 2 family comes in eight styles, speaks multiple languages, and, along with our entire catalogue, has been optimised for today’s varied screen uses. Please download the type specimen to find out what’s new in Coranto 2. A modern and indestructible serif font family with strong links to tradition. A contemporary, eclectic font family drawn from roots in Romanesque Europe. 6 styles plus matching italics. Small caps, arbitrary fractions, 5 sets of figures, and stylistic alternates. 14 styles in 6 widths, 84 alltogether. Multiple purpose font for editorial design for print and digital alike. 2 sets of figures, arbitrary fractions, superiors & inferiors. A highly legible and economic typeface, perfect for extended reading in editorials and newspapers. 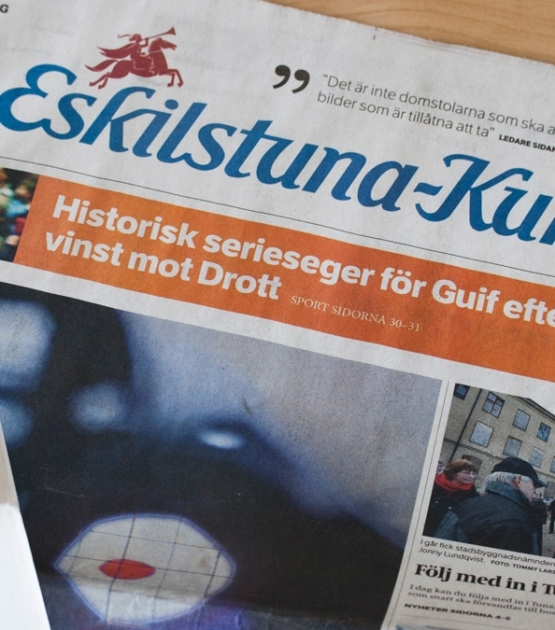 Eskilstuna-Kuriren is a local swedish newspaper in the berliner format published Monday to Saturday.